French tosafist, and author of a siddur ("Semaḳ" No. 154); flourished in the first half of the thirteenth century. Moses is generally supposed to have been the son of Yom-Ṭob, referred to in Elijah Mizraḥi's responsa (No. 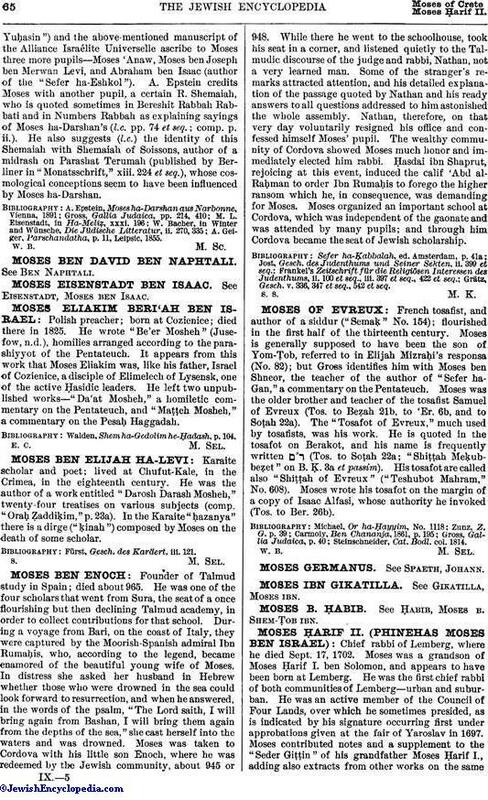 82); but Gross identifies him with Moses ben Shneor, the teacher of the author of "Sefer ha-Gan," a commentary on the Pentateuch. Moses was the older brother and teacher of the tosafist Samuel of Evreux (Tos. to Beẓah 21b, to 'Er. 6b, and to Soṭah 22a). The "Tosafot of Evreux," much used by tosafists, was his work. He is quoted in the tosafot on Berakot, and his name is frequently written (Tos. to Soṭah. 22a; "Shiṭṭah Meḳubbeẓet" on B. Ḳ. 3a et passim). His tosafot are called also "Shiṭṭah of Evreux" ("Teshubot Mahram," No. 608). Moses wrote his tosafot on the margin of a copy of Isaac Alfasi, whose authority he invoked (Tos. to Ber. 26b).